Produce a short music video for the Sunsweet Jingle! 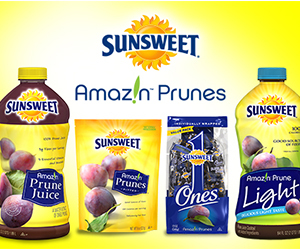 Sunsweet Amaz!n Prune Juice comes from the highest quality fruit, the Sunsweet Amaz!n Prune, which is delicious and packed with key nutrients. A serving provides 5 essential vitamins and minerals to help balance and maintain your digestive health to help you feel your best. They want your help in showcasing how Amaz!n Prunes and Prune Juice encourage you to eat right and feel good. Your mission is to produce a :30-:45 second music video for the Sunsweet Jingle! They’re looking for creative submissions that can feature one or multiple people singing their version of the Sunsweet Feel Good song (use the lyrics exactly as noted below). Insideout, got it figured out, I’m feeling good. Feelin’ light, cause I’m eatin’ right, I’m feelin’ good. People say I’m crazy but I feel good, and it feels good to feel good. Winning videos will be used on social and digital channels and may be incorporated into a TV spot. The video should be lighthearted, fun, and convey the “feel good” nature that’s infectious when you watch it. The video should incorporate at least one Sunsweet product throughout, and appeal to all audiences. Pledge this project and receive one 8oz Amaz!n Pitted Prunes, 12oz Sunsweet Ones, 64oz Amaz!n Prune Juice, and 64oz Amaz!n Prune Light for use in your video, just fill out the form on the main contest page. Open to Zooppa community members, 18 and older. Does eatin’ right make you “feelin’ light? It sure does when you eat Sunsweet prunes products! That’s why Zooppa partnered with them for a great open project. Your mission? Show your creativity and your “feel good” nature by creating a fun & light-hearted music video 🎬🎧 for their Amaz!n products! Don’t forget to pledge for the products, click hear to learn more 🙌!